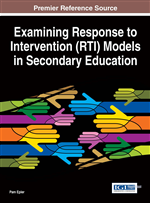 The Response to Intervention (RTI) service delivery model has been incorporated at the elementary school level with success but is still lagging behind within the secondary school environment. This chapter demonstrates how two secondary schools, one a middle school and the other a high school, implemented the RTI model efficiently and effectively. The chapter shows that the RTI model can be successfully executed in different ways depending on a school's needs, funding, and personnel. The chapter provides details on the diagnostic practices, data collection methods, intervention strategies, administrative support, and professional development of each implemented model and includes insight from actual teachers and school counselors who participated in the implementations. A reflection on lessons learned from each school site is included. The middle school started its RTI service delivery model during the 2009-2010 school term after a change in school superintendents. The school took a year to introduce the model to the teaching staff and then fully embraced it during the 2010-2011 school term. The school counselor was given the responsibility of implementing and maintaining RTI, and it was used throughout the entire school population, which amounted to approximately 300 students in Grades 6-8. In order to obtain firsthand knowledge of how the RTI service delivery model functions in the middle school, interviews were conducted with two of the people involved in the model. The school counselor and a language arts teacher, both of whom were licensed, practicing teachers, were interviewed. The language arts teacher (Teacher A) was considered a participant in Tier 1 in the school’s RTI model, while the school counselor (Teacher B), a former science teacher, was considered a participant in Tier 2 in the middle school’s RTI model. Teacher A was a female who was relatively new to the teaching profession since she had only been teaching for 3 years. She held a bachelor’s degree in teaching secondary English and was working toward her master’s degree in teaching. She was also the varsity girls’ track coach. She had four different language arts/English classes to prepare for on a daily basis and expressed a deep commitment to helping students achieve academic success. Teacher B was a female who taught high school science classes for 5 years prior to becoming a school counselor, a position she had held for 24 years at the time of the interviews. She had earned a bachelor’s degree in teaching secondary science and a master’s degree in school counseling. She knew the names of all the students in the school and knew half of the students very well because she was responsible for counseling them both academically and emotionally. She displayed a strong desire for doing whatever was best for the students’ welfare and success in life.